Diesel powered and hydraulic powered slab saws can cut inside or outside through concrete, asphalt and block pavements. They can cut from control joints to depths up to 18" thick. Wall mounted or hand held core drills drill round holes through walls and slabs made up of concrete, brick, block, asphalt material. 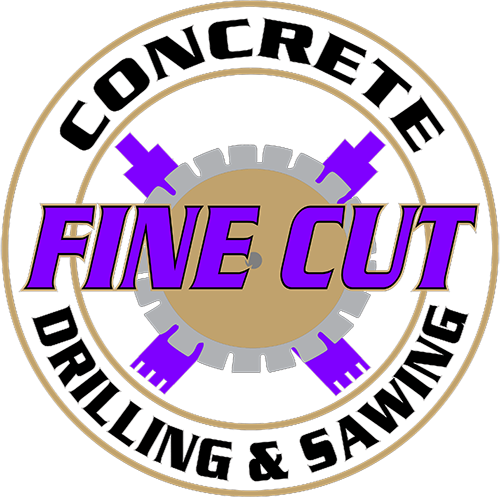 Mounted core drills can drill up to and beyond 48" diameters. Wall saws run on a track that is mounted to the surface that is being cut. Wall saws can cut a thickness of 24". It is the choice tool for cutting door openings and window openings, especially large dimensions. Wire sawing is the choice tool to cut concrete that is thicker than 24". It is unlimited in its versatility. It can cut raised slabs and bridges flush as designed. Hand saws are used for tight areas around walls and floors. It is the tool of choice for cutting small and large openings into walls and floors. The chain saw is the perfect tool to cut duct openings in concrete or brick and block walls. It is the optimal tool to cut clean, square corners, and thicknesses up to 25".